There is a premise that begins this tale of good versus bad religion: The reader must be a believer. The title of Rev. Martin Thielen’s first book provides an idea of where his second is going: What is the least I can believe and still be a Christian? Thielen spends his time telling stories and anecdotes from his own experience, replete with biblical quotes, to answer the questions as to what is bad versus good religion. Throughout the book, the reader will follow the lines of a liberal teaching Christian faith as Thielen takes his time to outline his premise. 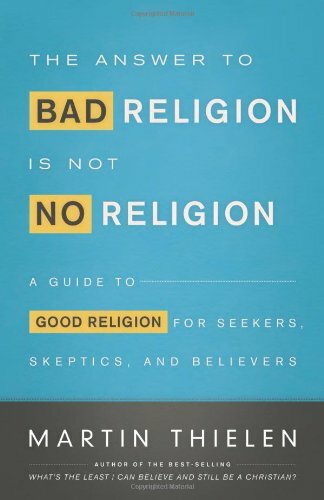 Though the book is a fine example of today’s liberal Christian apologetic writers, one must wonder if Thielen’s premise hold true with the title of the first chapter, “Bad religion engages in the self-righteous judgment of others.” In fact, what may be a “bad religion” to one would be perfectly fine to another and one could find examples of the five components of “bad religion” in all Christian, Jewish, and Islamic sects. This entry was posted in Atheism, Book Review, Christian Right, Christianity, Gay Rights, Liberals, Mythologies, Religion, Religious, Religious-Right and tagged Bad Religion, Christian Conservatives, Christianity, Good Religion, Liberal, Liberal Religion, No Religion, philosophy, Religion, Thielen. Bookmark the permalink.